Segments are one of the most powerful features of Google Analytics, and they are often useful for zeroing in on the sets of users who are most valuable to us. One way of looking at potentially valuable users is to look at the frequency with which they visit the website. Let’s look at a couple of ways to do that in GA. The dimension Count of Sessions has been around forever in GA, and it’s the one you’ll find in the Frequency & Recency report. Google Analytics keeps track of how many times a user has visited your website, and Count of Sessions is that count for each individual user. The count is incremented each time the user visits. So, for a new user, the count is 1 (i.e., it is the first visit to the site). The next time, the count is 2 (it’s the second visit). So Count of Sessions is useful in defining segments if you want to be able to show your most loyal users — say, users who have visited the site more than 10 times in their lifetime. You can find Count of Sessions as an option in the advanced Condition settings in creating a segment. What if instead of saying “this is the user’s third visit ever”, I want to say “show me users who have visited three times in the last 30 days“? Up until the recent changes with user-based segments in Google Analytics, you couldn’t do this. But now, there’s an easy option to get such a segment with the Sessions metric (you’ll find it in the Behavior section in the segment settings). If you specify Sessions ≥ 3 and look at a specific time period in a report, what you’ll see are only the users who had more than three sessions during that period. This is often more what we are looking for when we want to define segments around frequency, because the whole history isn’t important to us, we just want to know how frequently the user has been to the site in a recent period. There are a few other options that may be useful in combination with the above suggestions for defining segments based on frequency or loyalty. Second, we can know not just whether a user is new, but how new. The new option Date of First Session lets you specify a date range for the first session by that user. The API actually gives you even finer-grained control over how metrics are calculated in defining the segments. You can specify the scope over which a metric is calculated (at the user, session, or hit level) for the purposes of creating the segment. See the documentation for all the gory details. 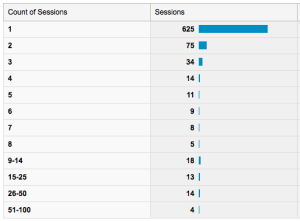 Google Analytics relies on cookies to make all of this possible. If a user clears their cookies or there is an implementation problem, you’ll see a user show up as a New User, when in reality, it may not be his first time visiting your site. Keep this in mind as you look at the frequency reports. How often people clear their cookies will depend on your site content and the audience it attracts. Segmenting by frequency and loyalty measurements can be especially useful for content-oriented sites (who are the users who are back most often to read more stuff) as well as ecommerce (they’re back again shopping). How have you combined these options in Google Analytics to get at segments of your most loyal users?